As per the Legend, Lord Narasimha appeared before Sapta rishi and blessed with Mukti. It is said that Lord appeared for a span of 24 min, hence whoever offers prayers on this hill for 24 mins will be relieved from sins. Hence, the hill got the name Kadigachalam, where Kadigai means 24 mins and Chalam means hill. It is also believed that Lord Narasimha appeared in Yoga posture before Prahalad and offered Mukti. 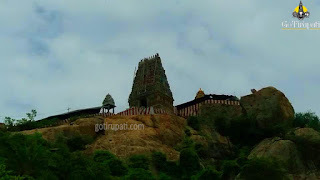 This temple was built during the reign of Vijayanagara Dynasty. Sri Acharya Swami and Swami Doddachar contributed in building the temple. As per the folklore, Anjaneya stood by the King Indrathymna during the war in slaying the demons, Arakkan Nikumban and rescued his kingdom. Lord Anjaneya self-manifested here in a Yoga posture. Devotees take bath in Chakra Theertham before trekking small hill. It is said that Yoga Anjaneya Swamy's eyes point the feet of Yoga Narasimha Swamy.